Climate is changing, forced out of the range of the past million years by levels of carbon dioxide and other greenhouse gases not seen in the Earth’s atmosphere for a very, very long time. Lacking action by the world’s nations, it is clear that the planet will be warmer, sea level will rise, and patterns of rainfall will change. But the future is also partly uncertain — there is considerable uncertainty about how we will arrive at that different climate. Will the changes be gradual, allowing natural systems and societal infrastructure to adjust in a timely fashion? Or will some of the changes be more abrupt, crossing some threshold or “tipping point” to change so fast that the time between when a problem is recognized and when action is required shrinks to the point where orderly adaptation is not possible? (December 3, 2013) ScienceDaily — Climate change has increased concern over possible large and rapid changes in the physical climate system, which includes Earth’s atmosphere, land surfaces, and oceans. Some of these changes could occur within a few decades or even years, leaving little time for society and ecosystems to adapt. A new report from the National Research Council extends this idea of abrupt climate change, stating that even steady, gradual change in the physical climate system can have abrupt impacts elsewhere — in human infrastructure and ecosystems for example — if critical thresholds are crossed. Further scientific research and enhanced monitoring of the climate, ecosystems, and social systems may be able to provide information that a tipping point is imminent, allowing time for adaptation or possibly mitigation, or that a tipping point has recently occurred, the report says. “Right now we don’t know what many of these thresholds are,” White said. “But with better information, we will be able to anticipate some major changes before they occur and help reduce the potential consequences.” The report identifies several research needs, such as identifying keystone species whose population decline due to an abrupt change would have cascading effects on ecosystems and ultimately on human provisions such as food supply. If society hopes to anticipate tipping points in natural and human systems, an early warning system for abrupt changes needs to be developed, the report says. An effective system would need to include careful and vigilant monitoring, taking advantage of existing land and satellite systems and modifying them if necessary, or designing and implementing new systems when feasible. It would also need to be flexible and adaptive, regularly conducting and alternating between data collection, model testing and improvement, and model predictions that suggest future data needs. An expert panel at the National Academy of Sciences is to alert us to abrupt and potentially catastrophic events triggered by climate change. The committee says science can anticipate some major changes to the Earth that could affect everything from agriculture to sea level. But we aren’t doing enough to look for those changes and anticipate their impacts. And this is not a matter for some distant future. The Earth is already experiencing both gradual and abrupt climate change. The air is warming up slowly, and we’re also seeing rapid changes such as the melting Arctic ice cap. Another potential for disaster is in the Arctic. There is a huge amount of methane gas up there. The report says the region is unlikely to belch methane into the atmosphere rapidly and supercharge global warming. But government agencies aren’t keeping a close eye on methane and other greenhouse gases in the Arctic…. We know there needs to be monitoring capability,” White said. “We know we need to be watching the planet. We watch our streets, we watch our banks — if you live in the U.K. they watch everything — we watch other parts of the system very well. “But we do not watch our environment with nearly the same amount of care and zeal.” The committee didn’t just consider abrupt changes to the planet. It also looked at gradual changes that could trigger rapid disruptions for us. For example, parts of the Earth could quickly become inhospitable to crops like corn, once the temperature creeps past a certain threshold. Those concerns are greatest in the tropics and subtropics. “Probably the biggest issues are going to show up in the warm places, even though it will be easier to see them, and we will meet them sooner, in the Arctic,” says , a glaciologist at Penn State…..
Hard-to-predict sudden changes to Earth’s environment are more worrisome than climate change’s bigger but more gradual impacts, a panel of scientists advising the federal government concluded Tuesday. The 200-page report by the National Academy of Sciences looked at warming problems that can occur in years instead of centuries. The report repeatedly warns of potential “tipping points” where the climate passes thresholds, beyond which “major and rapid changes occur.” And some of these quick changes are happening now, said study chairman James White of the University of Colorado. The report says abrupt changes like melting ice in the Arctic Ocean and mass species extinctions have already started and are worse than predicted. It says thousands of species are changing their ranges, seasonal patterns or in some cases are going extinct because of human-caused climate change. Species in danger include some coral; pika, a rabbitlike creature; the Hawaiian silversword plant and polar bears. At the bottom of the world in Antarctica, the melting ice in the west could be more of a wild card than originally thought. If the massive ice sheet melts it may happen relatively rapidly and could raise world sea levels by 13 feet, but researchers aren’t certain how soon that may occur. However, the report had what researchers called “good news.” It said two other abrupt climate threats that worried researchers likely won’t be so sudden, giving people more time to prepare and adapt. Those two less-imminent threats are giant burps of undersea and frozen methane, a super-potent greenhouse gas, and the slowing of deep ocean currents. That slowdown is a scenario that would oddly lead to dramatic coastal cooling and was featured in the 2004 movie “The Day After Tomorrow.” Study co-author Richard Alley of Pennsylvania State University compared the threat of abrupt climate change effects to the random danger of drunk drivers. “You can’t see it coming, so you can’t prepare for it. The faster it is, the less you see it coming, the more it costs,” Alley told The Associated Press. “If you see the drunk driver coming, you can get out of the way.” The scientists said the issue of sudden changes is full of uncertainties, so the world can better prepare by monitoring places like Antarctic and Greenland ice sheets more. But because of budget cuts and aging satellites, researchers have fewer measurements of these crucial indicators than they did a few years ago and will have even fewer in upcoming years, study co-author Steven Wofsy of Harvard University said. The panel called on the government to create an early warning system…. A scientific panel’s report ruled out some doomsday notions but said that dire climatic surprises seemed inevitable. The findings laid out below reinforce the reality that the biggest impacts of greenhouse-driven global warming still lie several generations in the future. A threatened population of steelhead in Bridge Creek, Oregon is limited by degraded stream conditions (Pollock et al. 2012). By reconnecting portions of this incised channel with its former floodplain, we hoped to improve habitat conditions for steelhead. Restoring connections between a channelized stream and its floodplain can increase habitat complexity in both the stream and its associated riparian zone (Pollock et al. 2007). However, conventional stream restoration techniques can be disruptive and quite costly. Large volumes of fill must be moved and graded with heavy equipment, exposing large areas of bare ground that require extensive re–vegetation effort (Pollock et al. 2012). After it was breached by high flows, beaver abandoned this dam (foreground). They rebuilt it within 1 year of reinforcement. An additional dam built on a post line is shown upstream. In 2009, we began a study to restore channelized streams by encouraging a local beaver population to build longer–lived dams (Pollock et al. 2012). Bridge Creek is a 710–km² watershed draining northwesterly into the lower John Day River. At present, its beaver population is small, with growth impeded by short–lived dams. Bridge Creek beaver dams are often short lived because they are built within an incised trench (Pollock et al. 2012). This means that when annual flooding occurs, pressure from heavy flows is concentrated on the dam rather than dissipated across the floodplain. Consequently, most beaver dams breach and fail within their first season. We predicted that stable beaver colonies would gradually aggrade the incised reaches of Bridge Creek enough to raise the alluvial water table and reconnect the stream to its former floodplain. Therefore, encouraging long–lived beaver dams would be a cost–effective method to produce measurable improvement in riparian and stream habitats, and subsequently in abundance of native steelhead. Our objective is to help beaver build dams that will last long enough to lead to the establishment of stable colonies. If this can be accomplished, the beaver dams should promote enough aggradation to reverse channel incision. Such a reversal would yield a number of ecosystem improvements for steelhead and other species. …. Cyanobacteria – known as the “cockroaches” of aquatic environments – have been around for more than 2 billion years. Over their long evolutionary history, they have learned to tolerate many extreme conditions and are one of the toughest microorganisms on Earth. Cyanobacteria are also largely responsible for creating the oxygen-rich conditions that stimulated modern life. But the bacteria, known for their blooms, have become quite a problem in the 21st century. In a research brief letter published in the October edition of Science, researchers from UNC Chapel Hill and Oregon State University describe how outbreaks of these bacteria are choking lakes and rivers across the globe – and how such outbreaks may worsen with climate change and human development…. You ever see a bird clutching onto a branch high in a tree and wonder, “What happens if it falls asleep? How could it hold on? In California, few issues are as divisive as water. It pits North against South, fisherman versus farmer. With cycles of drought, dwindling groundwater and a future marked by a changing climate and a thirsty, booming population, no other resource is as imperiled in the Golden State. The value of a marine reserve goes beyond the obvious: new research indicates that it helps ward off some of the effects of climate change. On the face of it, the value of a marine reserve — the equivalent of a national park or wildlife preserve on land — seems obvious. The oceans are in trouble, and setting aside regions of biodiversity, where fishing is strictly limited, if not prohibited, is one of the few effective means of protecting many species at once. But politically, there is nothing simple about creating marine reserves in international waters. Recently, China and Russia succeeded in blocking, yet again, the creation of a large marine reserve in Antarctica. New research indicates that marine reserves may have an even greater importance than scientists previously supposed. A study recently published in Nature Climate Change found that marine reserves do more than merely shelter species that live within them. By enhancing the resilience of marine communities, reserves help ward off some of the effects of climate change, including invasion by species from warmer waters. The study was based on research conducted at the Maria Island Marine Reserve, just off the coast of Tasmania. Though the reserve was only established in 1991, data on marine life there had been collected for more than 70 years. Comparing the reserve’s ecosystem with similar but unprotected waters where fishing was allowed, scientists found greater long-term and short-term stability. The overall health of the ecosystem helped create what the authors of the study called “a feedback mechanism to promote stability.” The scientists found a substantial increase in the number of large-bodied fish and much less fluctuation, year to year, in the population of smaller fish. This is a reminder of something that all too easily goes unnoticed. How species will endure the effects of global warming depends less on the individual species than the overall health of the ecosystem it belongs to. This study also suggested another essential service that marine reserves provide. By giving us a view into a relatively unaltered past — since the 1940s in the case of Maria Island — they show how healthy ecosystems function, which will be increasingly valuable as climate change disorders them. (December 4, 2013) — Regional climate changes can be very rapid. Geoscientists now report that such a rapid climate change occurred in different regions with a time difference of 120 years. Investigation in the west German Eifel region and in southern Norway demonstrated that at the end of the last glaciation about 12,240 years before present climate became warmer, first recognized in the Eifel region and 120 years later in southern Norway. Nonetheless, the warming was equally rapid in both regions. … The result of this study has some implications on the understanding of both past and future climate change. The assumption of an everywhere and always synchronously changing climate must be questioned and climate models have to better consider such regional aspects…. Scientists are working to ensure that the Endangered Species Act remains effective in the face of a changing climate. A special section in the latest issue of Conservation Biology highlights their progress. Forty years ago this month the Endangered Species Act became law, and since then it has proved an effective tool for protecting species near the brink of extinction and the habitats they depend on. But the world is a very different place than it was in 1973, and federal agencies are adapting their science and management to protect endangered species against the array of threats they face today. When the Act was written, no one was thinking about climate change. Scientists operated under the assumption that the environment varied but was not changing in any particular direction, and that the past was a good guide to the future. That is no longer the case. How should we incorporate climate change into our decision-making under the Endangered Species Act? A special section in this month’s issue of Conservation Biology addresses this question with eight papers authored by NOAA scientists and their research partners who work on marine and aquatic species. Humanity is choosing to destroy a livable climate, warn 18 of the world’s leading climate experts in a new study. Led by James Hansen, they make the strongest case to date for a target of 350 parts per million (ppm) of CO2 in the air, or about 1°C (1.8°F) total warming…..Humanity is choosing to destroy a livable climate, warn 18 of the world’s leading climate experts in a new study. Led by James Hansen, they make the strongest case to date for a target of 350 parts per million (ppm) of CO2 in the air, or about 1°C (1.8°F) total warming. Yes, we are already near 400 ppm (and rising 2 ppm a year), and have warmed more than 0.8°C since preindustrial times, so the authors understand the challenge. But in their must-read article in the journal PLOS One, the scientists argue that “aiming for the 2°C [3.6°F pathway would be foolhardy” because it “would have consequences that can be described as disastrous”: … sea level rise of several meters could be expected. Increased climate extremes, already apparent at 0.8°C warming, would be more severe. Coral reefs and associated species, already stressed with current conditions, would be decimated by increased acidification, temperature and sea level rise. More generally, humanity and nature, the modern world as we know it, is adapted to the Holocene climate that has existed more than 10,000 years. A key point of the new study — bluntly titled “Assessing ‘Dangerous Climate Change’: Required Reduction of Carbon Emissions to Protect Young People, Future Generations and Nature” — is that 2°C warming is unlikely to be stable because it “would spur ‘slow’ feedbacks and eventual warming of 3–4°C with disastrous consequences.” As Climate Progress has previously reported, the thawing permafrost alone is projected to add as much as 1.5°F (!) to total global warming by 2100 and ocean acidification could add another 0.9°F. …. Today, Restore America’s Estuaries submitted “Greenhouse Gas Accounting Methods for Tidal Wetland and Seagrass Restoration” to the Verified Carbon Standard to begin the approval process. This ground-breaking methodology opens the door for all tidal wetland and seagrass restoration projects that meet the eligibility conditions to calculate net greenhouse gas benefits and receive carbon credits. “This global methodology sets the stage to connect coastal restoration and carbon finance. We expect it will stimulate coastal wetlands carbon projects around the world, from mangroves and seagrass of the Coral Triangle to rebuilding tidal marshes here in the U.S.,” said Jeff Benoit, President of Restore America’s Estuaries. Coastal blue carbon refers to the role of coastal wetlands (tidal marshes, seagrass meadows and mangroves) in contributing to the global carbon cycle. Coastal wetlands sequester carbon dioxide from the atmosphere and store it in the form of biomass and soil carbon. Though only representing 2% of the world’s surface area they sequester 50% of the carbon that is transferred to marine soils and sediments. Coastal wetlands are under threat and represent one of the highest rates of loss for any ecosystem globally. At current rates, within 100 years most of the world’s coastal wetlands will be lost. In the United States losses are increasing as well. Restoration of coastal ecosystems brings benefits that support the livelihood of local communities, improve fisheries, reduce risk of flooding, provide future climate change adaptation benefits, and reverse ongoing greenhouse gas emissions from converted wetlands. Methodology development was lead by Restore America’s Estuaries with financial support from the National Estuarine Research Reserve System Science Collaborative, The National Oceanic and Atmospheric Administration’s Office of Habitat Conservation, The Ocean Foundation, The Curtis and Edith Munson Foundation, and KBR. …. (December 4, 2013) — Though recent studies focus on climate change impacts on intensity and frequency of tropical cyclones, a new review shows that sea level rise and shoreline retreat are the two more certain factors expected to drive an increase in future flood risk. … Sea level rise and its potential to dramatically change the coastal landscape through shoreline erosion and barrier island degradation, for example, is an under-appreciated and understudied factor that could lead to catastrophic changes in flood risk associated with tropical cyclones, known as hurricanes in the North Atlantic, they say. Woodruff adds, “There is general agreement that while globally, tropical cyclones will decline in frequency, their strength will be more intense. However, there is less consensus on the magnitude of these changes, and it remains unclear how closely individual regions of tropical cyclone activity will follow global trends.” Despite these uncertainties, the UMass Amherst geoscientist notes, the intensity and frequency of flooding by tropical cyclones will increase significantly due to accelerated sea level rise. Further, the geologic record provides clear examples for the importance of accelerated sea level rise in initiating significant changes in shoreline behavior. Global warming alters Earth’s water cycle since more water evaporates to the air as temperatures increase. Increased evaporation can dry out some regions while, at the same time, result in more rain falling in other areas due to the excess moisture in the atmosphere. The more water evaporates per degree of warming, the stronger the influence of increasing temperature on the water cycle. But the new study shows the water cycle does not react the same way to different types of warming…..
On Tuesday, the Atlantic States Marine Fisheries closed the Northern shrimp fishery in the Gulf of Maine citing record low stocks. .. I think everyone was startled by what we saw in 2012, and there was a lot of pressure to close down the fishery for the 2013 season,” said John Annala, Chief Scientific Officer at the Gulf of Maine Research Institute. “The survey this summer found just 20 percent of the 2012 record low, so it has fallen off incredibly sharply.” Perhaps most worrying is the fact that juvenile shrimp have not been picked up in a survey since 2010. Northern shrimp live about five years, so the lack of younger shrimp for three years straight may mean empty nets for years to come. “During the last ten years the water temperature in the Gulf of Maine has been running about 2.5 degrees Celsius or about 5 degrees Fahrenheit warmer than the previous one hundred year average,” Annala said. “We don’t know what the thermal threshold of this species is, but the Gulf of Maine has always been the southernmost extreme of their range, so we probably don’t have much wiggle room.” Even if Northern shrimp prove themselves to be more heat tolerant than scientists predict, the warmer waters in the Gulf of Maine are proving deadly to the shrimp’s food supply, tiny zooplankton. Last spring, the usual surge in plankton never happened. Many species of plankton are also at the southernmost end of their thermal tolerance. Warmer waters are also making the Gulf more hospitable to shrimp predators like dogfish and red hake. “Decisions like this one show how fishermen are on the front lines of the battle against climate change,” said Michael Conathan, Director of Ocean Policy at the Center for American Progress in a phone interview. “This is not a nebulous, maybe-someday-in-the-future problem. This is unchecked carbon pollution affecting livelihoods here in Maine today.”…. Scientists say the state has not adequately responded to a beetle invasion said to be caused by global warming. By Kiley Kroh on November 13, 2013 A new report from the World Meteorological Organization also found that sea levels hit a record high in 2013, making coastal communities more vulnerable to devastating storms like Haiyan. Ounce for ounce, methane has an effect on global warming more than 30 times more potent than carbon dioxide, and it’s leaking from the Arctic Ocean at an alarming rate, according to new research by scientists at the University of Alaska Fairbanks. New research predicts the continent to warm faster than the rest of the world, while also suffering increased droughts and deluges…. The research, which was conducted by 27 institutions and published this week in two scientific journals, found that by the end of the century, Europe could see average temperatures rise by 1 to 5 degrees Celsius, or 1.8 to 9.0 degrees Fahrenheit. That’s warmer than the IPCC’s most recent prediction of 0.3 to 4.8 degrees Celsius of average global warming by century’s end. The research also predicts an increase in heatwaves in south and central Europe and intense rainfall and droughts in Europe overall. That prediction is in line with previous research on extreme weather and climate change and is also in line with some of the extreme weather Europe has dealt with over the last decade. This summer, in the midst of a heatwave that baked much of Europe, Austria set an all-time high temperature record after one town hit 104.9 degrees F. And in 2003, a major heatwave caused 70,000 deaths in Europe. Another recent report from the European Academies Science Advisory Council found that over the last 30 years, Europe has experienced a 60 percent increase in damage costs of extreme weather events. And in October, a report from the Norwegian Meteorological Institute noted that extreme weather is “increasing in frequency and intensity within Europe” and made predictions of increasing droughts, extreme rainfall events, and heatwaves that backed up the most recent research. On November 19, 2013, the Global Carbon Project (GCP) published its annual update on the global carbon budget and emissions trends. International goals aim to reduce global emissions in order to keep global warming below 2 degrees Celsius, which requires limiting total global carbon dioxide (CO2) emissions to 1 trillion tons. GCP’s update, Carbon Budget 2013, tracks fossil fuel emissions to better understand the world’s current climate change situation, and what changes can be made to emissions trends to stay within our carbon budget The Carbon Budget 2013 reports that annual emissions have been steadily increasing, though the major contributors to such emissions have changed within the last several years. In 2005, developing countries surpassed developed countries as the greater contributors to climate change. This is due to emission levels falling in developed countries like the European Union and the United States, but skyrocketing in developing countries like China and India. Annual CO2 emissions from developing nations, which accounted for approximately one-third of global emissions in 1990, now account for nearly 60 percent of global emissions. 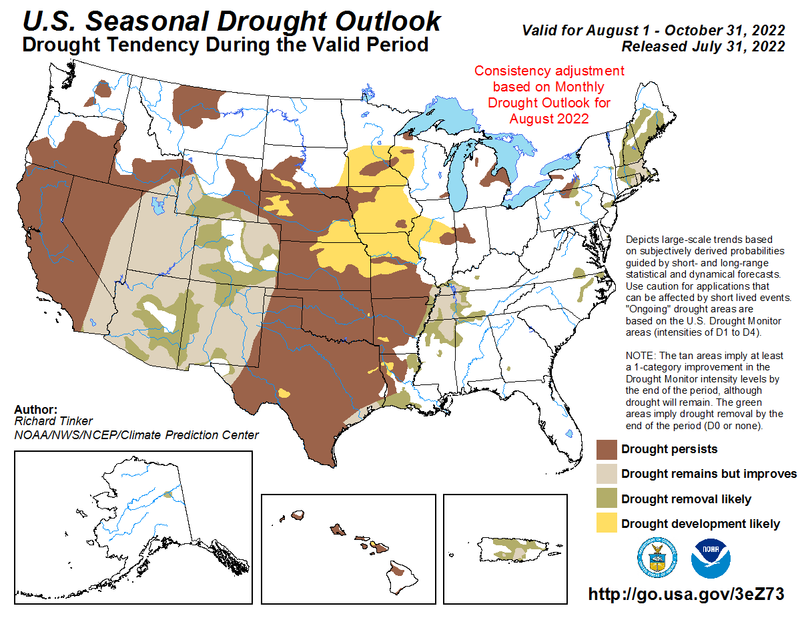 Winter is likely to offer little relief to the drought-stricken U.S. Southwest, and drought is likely to develop across parts of the Southeast as below-average precipitation is favored in these areas of the country, according to NOAA’s annual Winter Outlook announced today. Drought has been an ongoing concern across parts of the Southwest and Texas for nearly three years, and after some relief during the past few months, drought is likely to redevelop during winter. Sea surface temperatures across the equatorial Pacific have been near average since spring 2012, and forecasters expect that to continue through the winter. This means that neither El Niño nor La Niña is expected to influence the climate during the upcoming winter. The world’s climate is changing fast, and will continue to do so for the foreseeable future, no matter what measures we now take to reduce humankind’s impact on it. And as temperatures rise, rainfall patterns and amounts change, and pests and diseases find new ranges, the face of world agriculture will have to change too. Humankind is facing enormous challenges in feeding everyone on the planet. The Food and Agriculture Organization of the United Nations (FAO) estimates that 842 million people went hungry in 2011-13; that’s one in eight people worldwide. And the human population is still growing. By 2050 there will be another 2.4 billion mouths to feed. We will have to increase the amount of food we produce by 70 percent to meet the extra demands placed by population growth and changes in diets. Climate-smart agriculture — Success stories from farming communities around the world, shows that climate-smart agriculture can and does make a difference to millions of people’s lives. The booklet showcases 16 examples of successful climate-smart agriculture from both developed and developing countries. These initiatives are having a widespread impact on food security, adaptation to climate change and climate change mitigation, and are being implemented over vast areas and improving the lives of millions of people. The scale of Sunday’s deadly storms became clearer this morning: Six people dead in Illinois, hundreds of homes flattened and splintered, 81 tornadoes sighted through the Midwest, 358 reports of damaging winds, 40 reports of large hail. Chunks of seashore are vanishing from South Carolina’s Cape Romain National Wildlife Refuge as rising ocean levels and storms chew up the remote, unspoiled beaches some animals depend on for survival. The debate over how to address the disproportionate effects of climate change on poorer countries has gained momentum, but the steps can be politically daunting. I have been to countless summits and conferences on climate change, sustainable development and environmental policy in Asia in the past several years. Presenters, including me, often share findings from scientific research, show intricate charts and offer better ways forward while pointing to the risks of doing nothing – rising sea levels, deforestation, land degradation. What is often missing – and what has become so painfully clear in these past few days since Typhoon Haiyan tore through the central Philippines – is that what we’re really talking about is people. Climate change is about people. It’s about livelihoods that are affected and sometimes destroyed when severe weather ravages the land they depend on for income. It’s about displacement when they are then forced to leave home in search of a better life in communities that do not have the capacity to absorb them. And it’s about survival in areas that do not have the infrastructure in place to withstand extreme weather….. Some scientists believe they could relieve Earth’s rising temperatures by injecting material into the stratosphere to reflect sunlight. However, new research suggests one crucial weakness of the strategy: Once you start, you had better not stop. Things would quickly get worse. COP 19 Warsaw Wrap-Up: Where Does a Global Climate Deal Stand? COP16 established the Cancun Adaptation Framework (CAN), which sought to enhance action on adaptation under the Convention. Three Democratic mayors say the federal government can help their cities prepare for climate change by offering information and support — and trying to reverse policies that have inhibited disaster planning. Visiting Washington, D.C., a week before the first meeting of the White House’s new adaptation task force, the mayors of Salt Lake City, Boulder, Colo., and Pinecrest, Fla., praised the Obama administration’s Climate Action Plan. But while new efforts on adaptation and mitigation are important, Boulder Mayor Matthew Appelbaum said, “the first thing the feds should do is stop making things worse.” The mayors spoke at a forum hosted by the World Resources Institute and the Union of Concerned Scientists. ….. Climate change: No longer electoral Kryptonite! How did things go so wrong for a conservative Republican in the coal-rich state of Virginia? Earlier this month, voters in that closely watched battleground state rejected Ken Cuccinelli’s extreme, right-wing bid for governor and dealt a serious blow to the deep-pocketed oil companies that backed his candidacy. Of course, now is when the number-crunchers confer behind closed doors, in hushed tones, about what it all really means — for the midterms in 2014 and the primaries in 2016, for soccer moms and NASCAR dads, for women’s bodies and marriage equality, and for climate change. I am here to tell you: A new political dynamic is emerging. Climate change is a winner, not a loser…. Looking for inspiration when tackling Climate Change? In its November 2013 report, the carbonn Cities Climate Registry (cCCR) announced that 414 cities reported over 4,000 climate actions which are either completed or in progress until 2020. 63% of the reduction commitments are above 1% per year, exceeding the value of even the most ambitious national governments under the Kyoto Protocol. A new report finds that American cities are starting to favor more energy efficient modes of transportation. NY TIMES November 16, 2013 The debate over how to address the effects of climate change emerged as a flashpoint at a United Nations meeting in Warsaw that began this week, with some countries claiming the need for reparations for most vulnerable nations. But determining each country’s degree of guilt is a complicated task. The Carbon Risk Evaluation Tool allows investors, for the first time, to game out the risks of investing in fossil fuel companies. In the offices of Munich Re, the German giant of reinsurance – the business of insuring the policies of insurers, there wasn’t much debate as the claims cheques flew out the door: The higher frequency of extreme weather events is influenced by climate change. From the report: The Top Twenty Coal Mining Banks The following chart shows the top 20 commercial banks that have bankrolled the coal mining boom since 2005 (through mid-2013). At the top of the list are four U.S. banks, followed by banks from Germany, the United Kingdom, France, Switzerland, China and Japan. Collectively, these 20 banks represent 71% of the coal financing identified in this study. A full ranking of all banks can be found in the appendix. Environmentalists frustrated with Gov. Jerry Brown’s permissiveness of hydraulic fracturing have followed him to events throughout California, heckling him for his approval of legislation establishing a permitting system for the controversial form of oil extraction…..
Student fossil-fuel divestment movement persists. The student campaign to press colleges and universities to divest from fossil fuels is entering a new phase, now that administrators at several top schools have said no. The California delta’s water woes might seem distant, but if you live in Alameda, Contra Costa or Santa Clara counties, you may drink delta water. If you savor locally caught salmon, the delta’s health is crucial to maintaining the supply. If you love the dominant feature of our home, the San Francisco Bay, you should care about maintaining freshwater flows from the Sacramento-San Joaquin River Delta. Next month, the state will release the final (and 25,000-page) draft of the Bay Delta Conservation Plan, which includes a proposal to build a $14 billion “facility” and 30-foot-diameter twin tunnels to move water from the north delta to the state water pumps in the south delta. The public will then have 120 days to comment. The final document is anticipated next fall and a decision by the State Water Resources Control Board sometime thereafter….. The Bureau of Reclamation evoked Term 91 in parts of the Sacramento Valley and the Delta. That means no more water diversions for rice fields beginning this week through at least mid-November. The notice is in effect until 16 November, but land managers expect it to be extended until northern CA receives significant rainfall. During my aerial survey this week, I estimated around 40-50% of the rice fields in the Colusa and Sutter Basins were currently flooded. The Bureau of Land Management’s Utah state office on Friday decided to defer 99,960 acres of proposed oil and gas leases in and around the San Rafael Swell, which has been considered for everything from National Monument to National Park status. Is it harder to be the chief of state for an island nation threatened by climate change — or to be a cabinet secretary threatened by the White House Chief of Staff for talking about climate change? Contrast that to the Rainforest Action Network’s most recent Coal Finance Report Cards, which cite Goldman as large supporters of both mountain-top removal (MTR) coal mining and coal-fired power plants. The process of MTR uses explosives to blow up mountains in order to access coal reserves, forcing rocks and soil into valleys and increasing concentrations of mercury and arsenic in water supplies. Until this year, Goldman did not have any policy statements addressing the issue of MTR mining and its associated risks, while doing business in 2011 with Arch Coal and Alpha Natural Resources — the two largest MTR companies. Now, Goldman does have a due diligence policy for MTR transactions, which states that “we review companies’ environmental, health and safety track record, regulatory compliance, litigation and local community issues, remediation methods, and impact on water quality.” In 2012, Goldman financed both Alpha and Walter Energy, which cumulatively produced 29.42 percent of MTR coal mined in Appalachia that year, the RAN’s report said. In terms of coal-fired power involvement, Goldman provided $252 million in financing “as a lead arranger or lead manager in transactions” with coal-fired power companies profiled in the RAN’s 2013 report. Coal-fired power companies financed by Goldman include American Electric Power, Berkshire Hathaway, Duke Energy, Energy Future Holdings, FirstEnergy, NRG Energy, and the Southern Company. In an effort to compensate for the failure of central governments to address the dangers of climate change with comprehensive national policies, cities, states and regions have developed their own strategies to rein in emissions of carbon dioxide and other greenhouse gases. California’s ambitious plan aims to reduce emissions 80 percent by 2050 by requiring cleaner cars, more energy-efficient buildings and renewable fuels. Nine northeastern states have joined in a regional trading program aimed at reducing power-plant emissions. SYDNEY — Huge clumps of strange, pink-stringed jellyfish drifted into the protected bay near my home in Sydney last year. Thousands swarmed under the surface, stinging indiscriminately. I swam through them in a full-body wet suit for several long months with my swimming group, wondering if warmer currents had changed the habitat patterns. Scientists are now talking about a peculiar “jellification” of the sea, prompted by climate change. We smeared ointments on our faces and packed antihistamines and creams for the red welts on our exposed skin. When President Obama made his second State of the Union address, he talked extensively about the importance of addressing global climate change. “For the sake of our children and our future, we must do more,” he said. “But if Congress won’t act soon to protect future generations, I will. I will direct my Cabinet to come up with executive actions we can take, now and in the future, to reduce pollution, prepare our communities for the consequences of climate change, and speed the transition to more sustainable sources of energy.” Obama now seems to be making good on those statements. On Thursday, the administration released an executive order directing the federal government to triple its use of renewable energy by 2020, which would bring the government’s renewable energy usage to 20 percent. The order will apply to all federal agencies, including the military. The Associated Press, which obtained a copy of the executive order before it was published, noted that the federal government itself occupies approximately 500,000 buildings and operates 600,000 vehicles, and purchases more than $500 billion per year in goods and services. The order does not disclose the cost of the transition, but says the goal will be reached “to the extent economically feasible and technically practicable.” …. What happens when the energy price falls to zero? Numerous studies tell us that 100% renewables is possible, and cost effective. But how to structure an energy market where there is no fuel cost? Germany is already grappling with this dilemma, and the world is watching with interest. Kindergartners in Manhattan being served lunch on plates made from sugar cane, which are expected to replace plastic foam trays next year in six districts. Nothing seemed special about the plates from which students at a handful of Miami schools devoured their meals for a few weeks last spring — round, rigid and colorless, with four compartments for food and a fifth in the center for a carton of milk. Six big-city school districts are working to persuade suppliers to sell healthier and more environment-friendly products, like compostable food trays. Nelson Mandela, who died yesterday at age 95, leaves two legacies for climate hawks — the necessity of persistence and the value of divestment. Who among us can even imagine the persistence required of a man who spent more than 27 years in jail — from 1962 to 1990 — in his quest to end Apartheid? But his indefatigable spirit triumphed, and he was elected the first black president of South Africa a little more than 4 years after his release. His forbearance and moral sensibility prevented what many saw as an inevitable civil war and achieved, instead, national reconciliation. Climate hawks have already begun to take a page out of the strategy that helped bring down apartheid. Bill McKibben discussed that very point in a 2012 National Journal profile: McKibben now plans to pressure U.S. institutions, starting with universities, to end their financial investments in oil, gas, and coal companies. He’ll launch a 20-college tour, joined by Nobel laureate and South African human-rights activist Archbishop Desmond Tutu, to pressure university boards, via student protests, to end university endowment’s holdings in fossil fuels. And, finally, he also wrote this: I have walked that long road to freedom. I have tried not to falter; I have made missteps along the way. But I have discovered the secret that after climbing a great hill, one only finds that there are many more hills to climb. I have taken a moment here to rest, to steal a view of the glorious vista that surrounds me, to look back on the distance I have come. But I can rest only for a moment, for with freedom comes responsibilities, and I dare not linger, for my long walk is not yet ended. Emily Atkin assisted with the research on this piece. Photo via iHeartClimateScientists. As the life of one of the world’s great heroes draws to a close it provides an important opportunity to reflect back on Nelson Mandela’s long and courageous life in order to draw inspiration from one of the world’s moral stalwarts who weathered the storms of oppression, racism, injustice and inequality & not only managed to come out of the other side a smiling, compassionate & forgiving leader, but in doing so navigated a path through those storms which has helped to inspire generations of leaders to come. While climate change was not the issue that defined Mandela’s Long Walk to Freedom, a reflection on Mandela’s philosophy and life reveals a profound overlap with the principles and commitments of the climate justice movement, and therein lies many important lessons not only for the climate community but for humanity as a whole to learn from. Oh, Amazon? Birds Are Going to Attack Those Delivery Drones.